new to this forum and to decware. Is the HDT MKII a step up over the ERR? How do i choose which would be better suited to my room or my listen preference? Also, the specs says the ERR goes down to 34 HZ while the HDT to 38 HZ. I thought the HDT should dig lower with its cabinet design, am i mistaken? Haha, just read my post with the portuguese translation and a few words were odd. Fun to read. Anyway, hopefully someone can give me some advice. I confess that I have never heard the HDT. But in my opinion it is not designed to be "a step up" from the ERR. (Also the ERR is the newer of the two designs). Both are different speaker designs with different intents for sonic reproduction. I have the ERRs after owning all but one of the previous Radial designs from Decware. I've fallen very hard for the reproduction of the imaging and soundstage in the omni-directional Radial line. That's the way I want to hear music now, it seems natural and yet detailed, it's full of depth and color. I'm sure the HDTs are excellent. There doesn't seem to be a bad speaker in the line. I can see you more often in the forum then Steve. I thought he is the owner/chief designer, but i find it that he doesn't frequent the board much and some of the problems/question posted aren't even answered from him. I find that to be odd. And it doesn't look like he is helping much for his customer. Strange. Well, I think the truth is we would need a clone of Steve if we wanted to see him more often on the forum. Business is good for him, and he's a builder and designer and R&D scientist and husband and father and music lover and musician and. . . . He's a busy man! It's been pointed out many times on the forum that the best way to reach him is to call him. So if you ever have a pressing problem, it's best to give him a call. I have HR-ONEs, Bob Ziegler's design (ZYGI the Decware speaker builder) which use a radial driver, a forward firing driver and a tweeter. Also MG944s so I can't help you with direct experience. Finally for this sort of question, if it is not answered here, you would find talking to Steve the best method if this is possible for you. He has listened to both speakers a lot, his ears are very well tuned, and my experience with him says that he very much wants you to help you have a great musical experience from the gear. An obvious difference from the descriptions is that the radial is very well suited for untreated spaces, and the HDT is extremely revealing and fast, showing all the nuance and details of the gear going into it. Like Steve said, he uses them to more quickly hear issues while designing amps. From my experience of the radial on my HRs, compared to the front firing MGs, the radial has a very seductive sound that is atmospheric in a sort of indescribable way, but also fast and detailed. Do you have a dedicated room, or one where you can do room treatment? This might be the first question to resolve. 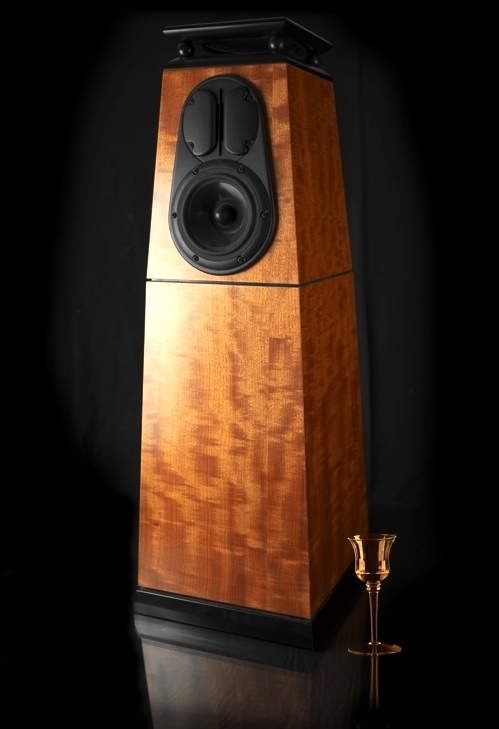 Like Lon said, all the speakers are going to be surprisingly good, so you can't go far wrong. I have the Turning Point Audio HR-1s as well in my bedroom system; used to use them in my main until I got my ERRs. I'd say the HR-1 is about 40 percent of the ERR sound and 60 percent what I would guess would be similar to the HDT sound. A very good speaker indeed. I have to say I do prefer the ERR, but that may not be the case if I had not lived with Radial speakers for years before hand. In Steve's defense here and he doesn't really need to be defended....While at Decfest this year I was busting him about his e-mail responses to me, sometimes being just one word. We went up to his office and he showed me his emails from just the two days during Decfest, which he hadn't responded to, there was over 200 emails. Some spam for sure but mostly e-mails that needed his attention. Then, during the day, he is pretty much on the phone most of the day talking with customers, after the shop closes down, he then gets to work building the amps he builds, sometimes working until midnight, so you see there isn't much time left in a day to scan over the forum and find questions for him....I once suggested to him to have a separate forum heading called "Questions for Steve" which may help as he wouldn't have to read the entire forum each day looking for questions for him and it may let people read his responses which may also answer their question. Trying to answer your direct question....It would depend on the size of your room. Both HDT's need a larger room where as the ERR's can work extremely well in a smaller room. I find in my room, If I was considering the HDT MKII's I would go with the DM945's instead. My room is 12" X 16". In Steve listening room, which is 16 by 20 something, the HDT and HDT-MKII work well and sound amazing but between the two it would go back to personal taste. The MK-II being a bit more laid back with a warm sweet sound, where as the HDT a little more in your face detail. That comes with a bit more showing up problems up stream, whether its hardware or software. Bad recording will sound bad with the HDT's where as the MK-II's can be completely listenable with a crappy recording. The ERR's would be somewhere in between. If we can use light as an analogy here, think of the ERR as being a torch light facing the ceiling, spreading its light evenly around the room. Think of the HDT-MKII as being a flood light shining in your face and the HDT being a spot light. If you have a larger room and have to sit far field then the MK-II might be a better choice, over the ERR's. If you have a large room that a lot of passive listening is done, the ERR's can't be beat for passive listening in a large room. I've heard all the speakers, but I fail at telling people what a particular amp sounds like with said speaker, in that department I'm limited on what I have on hand. Lon, Will...I think you two coming from different speakers makes the difference between both of your takes on the HR-Ones. Will is coming from a forward firing conventional speaker, and is getting a bit of something new with the radial/omni effect. Lon, you are coming from an almost completely omni speaker and are getting a bit of a conventional forward firing speaker. You're almost going backwards away from the true omni effect which you love so much. Thanks for weighing in Bob. First hand evidence of how busy I imagine that Steve is. It's exhausting to even think of this sort of busy-ness, except I can remember that when I was doing things that I loved and had control of in the way that Steve loves and has control of his work, I was so happy to be that busy that it nourished rather than depleted me. It's a rare thing to have this sort of "labor of love," and I can hope to have that in my life one day. And I think you're absolutely right in my assessment of the HR-1s (is it HR-1 or HR-ONE, seems I saw it in the beginning as the former and now the latter!) . . .I love the full Radial sound and the HR have that sound AND a more conventional sound, which is fantastic too. Ricardojoa, you just can't go wrong with any of the speakers, but Bob has given you a really good way to evaluate which may be best for your room and system. It sort of all goes to which looks better in print....HR-1 vs HR-One vs HR-ONE. They are all saying the same thing I guess, but I'm leaning toward the HR-One at the moment. Or is it when I get lazy I use HR-1 ???? Another thought crossed my mind in regards to ERR's vs HDT-MKII is cost and shipping overseas. ERR's are cheaper and shipping overseas is about half the cost of shipping HDT-MKII's if that has any influence on ones dissuasion. Thanks for clearing up the nomenclature! Hi Zigy! Thanks for the brilliant analogy to explain the characteristics of those speakers. May I ask where in this continuum (from focused light beam to diffused ceiling enlightenment) lay the DM945's? Thanks! Me disculpa, Ricardojoa, mais eu tinha de aproveitar agora pra fazer issa pergunta. Ta bom? Wow, many thanks to Lon, Will and Zygi for taking time to describe Steve's creations!! Anyway my room is small and is multifunction. The ERR seems to be a good candidate, but im afraid of the less specific imaging they provide. The HR1 seems like an even better candidate but im afraid Steve no longer make it, is that right?? Is all good fireblade, i like that spanguese. Ha Ha! Sorry, I learned my portuguese in S. Paulo, and it's been a while now. Welcome to the forum. I would NOT in any way shape or form say that the ERR imgaing is lacking in specificity! The whole presentation is different, but there's no disappointment in imaging, if anything it's "expanded." I think the advantage of the ERR is that it images well and sounds great in more rooms, requiring less, or no treatment to get good imaging! With proper placement and with good gear in front of it, you will very likely get great imaging from the ERR. Ah, good point on the imaging...however for some reason with crappy SS (mid-fi) gear the image can sound a bit contrived. This is probably only due to the fact that SS does not image like a Decware amp. Lon makes a good point about the ERR's imaging ability. They are very pin point/focused and expanded both. Some speakers that use a omni type high frequency drivers do have that "singers mouth is wider that the speaker" effect, not so with the ERR's. The best part about the ERR's, and I've said this many times, you can place them at arms length on both side of the listening chair, close enough for a drink to be set on top of them, and you would never know they weren't 6 feet in front of you. You can also place them 6 feet in front of you and 1-1/2 to 2 feet apart and think they were in the normal listening triangle most of us use as a set up. Bass issues would be just like any speaker if they were placed to close to the room boundaries. Other than that, placement is much more forgiving than any other speaker Decware sells. Fireblade. The DM945 falls in the flood light category. They are as smooth as silk, yet still convey enough detail not to feel like any is lacking. Yet a not so good CD can sound real good as well, at least enjoyable. Bass is adequate for such a small speaker. Ricardojoa, The HR-One's will be available soon on the Decware site. The retail will be close to $4800.00 however. Steve has the page, sort of done except my prose, but I was waiting until I got a little more caught up before sending it to him. Then when his dad got sick, I figured if I didn't give it to him, he wouldn't spend the time on it, he had enough to think about. Soon, I hope. Can't wait too see the hr1 page up, at least to know the construction and design. I have lust in my heart for a pair of HR-1's in RED. Jimmy Carter would be proud. You would have to paint them yourself so they would match the "Infamous RED TORII" I don't think you could get that color just anywhere.